At a time when several mainland capitals face the prospect of severe water shortages within a decade, and accusing fingers are pointed at thirsty domestic gardens, Australians are being urged to abandon conventional approaches to gardening in favour of ‘water wise’ ones. In this context, there is much to be gained by an increased understanding not only of why people in Australia garden, and why they choose to garden as they do, but also of the range of possibilities for gardens in Australian landscapes. An historical study of gardens – and their absence – in the Eastern Goldfields region of Western Australia contributes to such understandings, not least through the stories of longing, adaptation and attachment that emerge from settler responses to the problem of gardening in a context of water scarcity. The stories I am concerned with here are all tied, in one way or another, to the discovery of gold in Western Australia at Coolgardie in 1892 and Hannan’s (later Kalgoorlie) in 1893. As news of the discoveries spread, fortune-seekers flocked to the area. At first they set up camp in tents or tin huts, but soon many sought more permanent dwellings, and houses – even if still clad with tin or canvas – began to appear in the streets of the main settlements. Gardens, however, presented a greater challenge, as conventional English-style gardening was impracticable in the goldfields environment. Rainfall in the region may vary significantly from year to year, with prolonged dry spells fairly common, though the long-term annual average is around 260mm. Average evaporation is over 2.5m per year occurring mainly from November to February, when hot, dry winds blow from the north and northeast, often taking temperatures above 40 degrees. There is very little surface water, and much of that is saline. South of Kookynie, the groundwater is generally saline or even hypersaline, and thus useless for either drinking or gardening. Prior to the rush, the area was covered by open eucalypt and acacia woodland, interspersed with low shrubland. As such, it was hardly a ‘desert’. It was, however, subject to water scarcity. As the population increased, water was sought in small dams and gnamma holes, or carted in – first via camel and later by train. Tanks were another solution, though they proved to be both expensive and inefficient. More water was sourced from condensed saline groundwater: an ingenious solution in some ways, but the condensers – like the mines – were hungry for fuel, and ultimately contributed to clearing of the surrounding woodland.1 This deforestation exacerbated the harshness of the environment, and probably also increased the amount and mobility of dust, as the surface of the soil was further exposed to the wind. To the extent that newcomers to the goldfields encountered a ‘desert’, it was a recent human creation. In the Victorian gold rush towns of Ballarat, Castlemaine and Bendigo, public and private gardens were a source of considerable pride, representing as they did the transformation of wilderness to paradise, and the ‘progress and achievement of the inhabitants’.2 In the eastern goldfields of Western Australia, similar desires could not be fulfilled, in any conventional way, until the Goldfields Water Supply Scheme reached Kalgoorlie in 1903, bringing water 552km uphill, via a pipeline and pumping stations, from Mundaring weir in the hills east of Perth. On the 60th anniversary of the scheme’s completion, the state Public Works Department assured West Australians that the ‘lawns, trees, shrubs and attractive beds of perennials and annuals’ found in Kalgoorlie’s Victoria Park and Kingsbury Park provided ‘a welcome and necessary retreat from the arid landscape of the Goldfields’3 But how then did residents cope with the landscape prior to the arrival of the pipeline and in areas that remained beyond its reach? And more specifically, were conventional ideas about the role and function of the garden modified in this environment? Residents of the wildflower country around Leonora also found beauty in the landscape, even recognising it as garden-like. For Jean McGrath, arriving in 1901 as an 8-year-old, ‘Leonora was the most beautiful place you could wish to see. There were miles of beautiful Sturt peas; yellow and white everlastings and flowers of every colour. They grew right up to mother’s back door.’5Similarly, in 1931, Bert Fawcett wrote to his family that at Sturt Meadows station near Leonora, ‘All the wild flowers are in bloom and the whole country looks like a garden’.6 Here, the conceptual division between garden and nature was blurred, if not entirely abandoned: the landscape had many of the qualities of a garden, but appeared to lack an element of cultivation or artifice. The boundaries between garden and bush were also blurred for Trixie Edwards, who arrived with her family in Yundamindra, south-east of Leonora, in the mid-1930s. There, they had a very limited supply of water, having to cart it 10 miles from the nearest soak. Their mud and stone house apparently didn’t have a garden around it, though their ‘garden’ was, in a sense, distributed throughout the district. Trixie’s mother grew some vegetables – mostly greens – down at the station tank, but Trixie and her siblings also ‘knew every quandong tree in the district’, and in season would collect quandongs as well as the young fruit of a climbing plant, called ‘silky pears’.7 For entertainment, they would go walking in the bush, looking for flowers, fruit, or clumps of Sturt desert peas. Although it is not clear whether they attempted to manage the plants they encountered in the bush, the wild flowers and food plants seemed to have formed part of a continuum with the vegetable garden; if the bush was not, strictly speaking, a garden space, perhaps it was an effective garden substitute. In the more densely-populated settlements, where the woodland shaped by Aboriginal practices had been cleared, there was less potential for seeing and treating the surrounds as a garden. Environmental philosopher Isis Brook has pointed to evidence that plants (in a generic sense) have a positive effect on human well-being. She has also argued that particular, familiar plants play an important role in helping migrants establish relationships with new places, as they constitute a living, interactive connection with the old ‘home’ environment, and are themselves responding to the new place.8 Certainly, some goldfields settlers seemed to need plants around them, but given the lack of water, it was not possible to substantially re-create gardens from previous homes. Instead, different plants – and fewer – were made to stand in for more conventional, substantial gardens, satisfying psychological and practical needs, and performing similar symbolic functions. Some residents in more favourable, settled circumstances used wastewater to cultivate small outdoor gardens of drought-tolerant trees, shrubs and vines. One goldfields woman remembered that ‘despite the scarcity of water Mother always managed to have a small garden – hardy plants like dolichos creeper and geraniums. Every drop of used water went on to the garden’.14 Goldfields forest ranger Charles A. White, a collector for Baron von Mueller, encouraged residents to plant pepper trees and sugar gums, offering in 1895 to distribute seeds of these species ‘to any one who will promise to look after them till the plants are strong enough to resist the droughts’.15 The pepper tree – a fast-growing drought-tolerant species now seen as a potential ecological pest – seemed a godsend to goldfields gardeners, and nurtured for rapid growth. Alicia Pell recalled that ‘our usual method of bathing was to use a small basin of water to wash in and then pour it over our body in the form of a shower catching it in a hip bath. Later it succoured the precious plant or pepper tree.’ On arriving in Kalgoorlie in 1896, Pell had been dismayed by the ‘red red soil very cracked and sun baked, and men’s camps dumped down anywhere, higgledy piggledy’ but noted that ‘Occasionally one saw a very tidy camp even with a weary pepper tree beside it, which stood out like a good deed in a naughty world.’16 Her choice of analogy perhaps reflects a moral dimension attached to garden-making, as a symbol of settled domesticity that served to temper or balance the unsettled, highly masculine landscape ravaged by mining. One who seems to have had significant personal investment in making gardens from the desert was Kalgoorlie Mayor H.G. Parsons. A graduate of Oxford and lover of the classics, in 1897 he was undertaking ‘extensive lawn and tree-growing experiments’, including the cultivation of a nursery of ‘vigorous young pepper trees’ at his property in the Kalgoorlie suburb of Piccadilly. 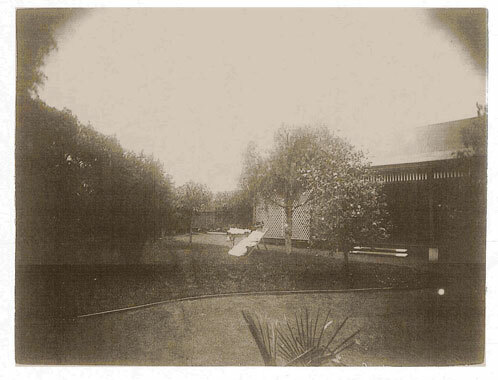 He also donated 100 grape vines for an experimental plantation.22 At this time the Council also asked the Conservator of Forests, J. Ednie Brown, to suggest trees for planting in the recreation reserve and streets.23 Their intention in looking to plant street trees was probably not only to fulfil a practical need for shade, but also to cultivate civic pride. 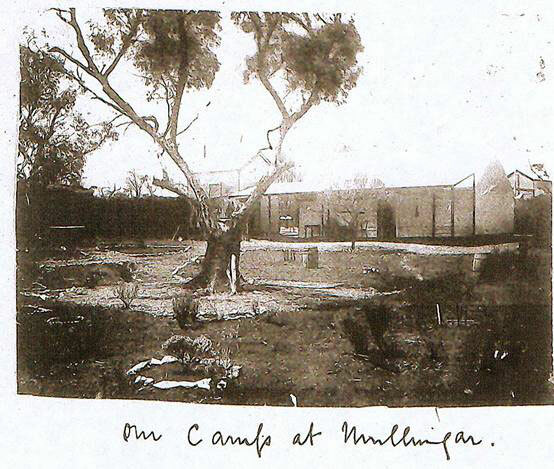 For cottage gardeners in Coolgardie and Kalgoorlie, the emphasis was not so much on re-creating a landscape in the image of the ‘old country’, as it was for some in Ballarat,28 but on meeting cultural and physiological needs for shade, food, greenery and beauty, as well as conveying that sense of domestic order that formed part of Victorian notions of civilized living. Necessity saw drought tolerance given preference over nostalgia in plant selection, although it may be that settlers gained most satisfaction from species that were familiar, or reminiscent of familiar species: if they saw echoes of willows in pepper trees, and Dutch tulips in Coolgardie ones, perhaps such plants formed a living connection between old homes and new. In addition to the native trees, the garden contained a ‘she-oak sort of shrub’ that doubled as a Christmas tree, a Boronia, grape vines and passion fruit cuttings. It was also home to their trio of West Australian parrots, which constantly attracted wild relatives from the surrounding bush. found ‘far more poetry in a goldfields life than one would at first suppose’, but on the other, she missed Tasmania, and regretted that there was ‘little to make us forget that we live in the midst of a desert’. 31 She was a well-read and imaginative woman, and her garden, though not conventionally picturesque or beautiful, appears to have been especially valued as a means by which to connect her family with historical and fictional worlds. In addition to ‘Lady Maude’, the trees were named after writers, family, or historical figures: Lord Bandon, Edna Lyall, The Poet Crabbe, Wordsworth, Saint Cyril (after her eldest son), Sir Tristram and Prince Charlie. Particularly when the children were young, the garden served as a springboard for imagination: they hung stories from the trees, and wrote letters in their shade. After the sudden death of her daughter Yolande, Maude continued to garden: in 1901, thanks to ice plants and pepper trees, she was able to maintain ‘a goodly amount of green’, and with stocks and migionette, as well as ‘the bush flowers’, she kept her ‘camp adorned quite prettily’, and gave many flowers to friends as well. 32 Here, the garden was serving more conventional, pragmatic purposes. When water from the pipeline became available, her garden took on a more conventional form, with neat lawns and leafy shrubs. Returning then to our key question, what can this brief survey of people and plants in the goldfields tell us about the modification of conventional ideas of the role and function of gardens in waterless lands? Many had come to the goldfields to make money, not gardens, and although the lack of greenery many have been regretted, there were few opportunities in the daily round for working men and women to make good the deficit. Some found themselves in areas of apparently natural beauty or abundance, and recognised their garden-like qualities: for a fortunate few, some of the traditional functions of the garden – as a source of beauty and food – were performed by the bush around their homes. Others, living in less favourable circumstances, appear to have found it psychologically difficult to cope in a dusty, arid environment without some recourse to the softness and greenery of a garden. Some found a substitute in the microcosm of a potplant or tray of wheatgrass. Others sought out hardy species – including indigenous ones – and nurtured them with wastewater. Camp and cottage gardens, even if sparse, could be read as potent symbols of settled domesticity and a civilised life, and may have invoked biblical narratives of redemption. It appears likely that the traditional role of the garden as a signifier of class status was maintained, perhaps amplified, in a context in which water was expensive: only the elite were in a position to invest in the creation of a garden on all but the smallest scale. Even these people, however, were prepared to rationally reassess traditional ideas about the appropriate content of the cottage garden, finding drought-tolerant species, including indigenous ones, to enable them to approximate conventional garden forms. This was a form of adaptation that was all but terminated by the arrival of the Mundaring water. Thereafter, gardening enthusiasts could cultivate lawns and more delicate species in defiance of the desert: indeed, they were playing a part in redeeming it. Perhaps the most interesting example of a modified role for the garden in a waterless land is Maude’s whimsical garden at Mullingar. Comprised as much of stories and dreams as plants and rocks, it was an unconventional garden for a ‘picnic kind of life’,33 and provided a means by which she could both escape from, and connect with, the arid goldfields landscape. In alien surroundings, the desire to garden can be strongly felt, yet evoke creative responses within environmental constraints. Andrea Gaynor is a Lecturer in History at the University of Western Australia. This research would not have been possible without the assistance of Jane Davis, who introduced me to Maude’s wonderful journal; Criena Fitzgerald, who provided me with a copy of her interview with Trixie Edwards (undertaken as part of a project coordinated by Dr Pat Bertola [Curtin] and Dr Pamela Sharpe [UWA] and funded under the WA 175th Anniversary Grants Scheme); and Nicole Crawford, who assisted me with the preliminary research. 1. The human and environmental dimensions of this deforestation are examined by Bill Bunbury, Timber for Gold: Life on the Goldfields Woodlines, 1899-1965, Fremantle Arts Centre Press, Fremantle, 1997. 2. Suzanne R. Hunt, ‘Vegetable Plots and Pleasure Gardens of the Victorian Goldfields’, in Iain McCalman, Alexander Cook and Andrew Reeves (eds), Gold: Forgotten Histories and Lost Objects of Australia, Cambridge University Press, Cambridge, 2001, p.276. 3. Pubic Works Department, Goldfields Water Supply Scheme: Commemorative ceremony… to mark the 60th anniversary of the official opening of the scheme at Coolgardie and Kalgoorlie, Perth, The Department, 1963, p.16. 4. Earnest Allnutt, A Trip to the WA Goldfields, ca. 1897-1898 [manuscript], ACC 2533A, Battye Library, Perth. 5. Jean McGrath, interviewed by Colin Puls, OH170, Battye Library, Perth, 1976, p.2. 6. Bert Fawcett, Letters to Home: Reflections of Rural Life in the 1920s, Geraldton, Anthea Kalazich, 2000, p.60. 7. Trixie Edwards, interviewed by Criena Fitzgerald, 2003. The quandong is Santalum acuminatum, and the silky pears are from Leichardtia australis. 8. Isis Brook, ‘Making Here Like There: Place Attachment, Displacement and the Urge to Garden’, Ethics, Place and Environment, vol.6, no.3, 2003, pp.227-234. 9. Catherine Bond, Goldfields and Chrysanthemums, London, Simpkin, Marshall, 1898, p.24. 11. Louie C. Ware, ‘Life on a Westralian Gold-field’, Part III. Williamstown Advertiser, 22 February 1908. 13. Louie C. Ware, ‘Life on a Westralian Gold-field’, Part III. Williamstown Advertiser, 22 February 1908. 14. Kalgoorlie Tales & Verse, Kalgoorlie, F.A.W. Goldfields Branch, 1984. 15. Coolgardie Miner, 3 January 1895, p.2. 16. Alicia Pell, Reminiscences, 1897 [manuscript], Acc 676A, Battye Library, Perth. 17. Colin Turnbull, interviewed by Michael Adams, OH 406, Battye Library, Perth, 1980-82, p.15. 18. Coolgardie Miner, 29 April 1898, p.6. 19. WAPD, 21 July 1896, p.151. 20. ‘Desert or Garden?’, Desert Echo, December 1915. 21. although the desert also appeared in a positive light in the bible, as a place of prayer and purification. 22. Kalgoorlie Miner, 10 April 1897, p.6. 23. Kalgoorlie Miner, 26 January 1897, p.2. He replied that sugar gums, pepper trees, tamarisk, robinia, various pinus and acacias, white cedar, cork elm, and kurrajong would all be appropriate. 24. Kalgoorlie Miner, 26 May 1897, p.4. 25. Kalgoorlie Miner, 9 December 1898, p.4. The leading citizens included Dr Swanston and the wives of attorney and mine manager A.P. Wymond and Warden John Finnerty. 27. Kalgoorlie Miner, 9 December 1898, p.4. Eventually, this species was bred for cultivation and is now available to gardeners in Europe, the UK and USA, although being less easy to grow, it is not as popular as its close relativeAlyogyne huegelii. 29. Maude Wordsworth James, Scrapbooks, 1897-1907 [manuscript], Acc 4793A, Battye Library, Perth, p.12.